On the morning of the first-ever BSMS graduation ceremony, my time spent there from 2003-2006 being responsible for my late flowering as a runner, I did a session of three fast miles, with the usual mile warm-up and cool-down and quarter-mile recoveries, along a hot and busy, by Seaford standards, Front. I ran my long run in the heat, a round trip to Bo Peep, Firle Beacon and back on the ridge above Bishopstone and Denton. I found it harder than I'd expected, in spite of lots of water before and during. Perhaps it was reading Murakami on his 100k ultra in the Observer. I should have done 13 miles but had to settle for eleven and a half. Both barley and wheat are ripe now, and I ran next to a combine harvester for part of the way. My anti-histamines seemed to do the trick.. Just after the peak of Firle Beacon, in the manner of the man versus horse race in Llanwrtyd Wells, I raced some cows, but beat them easily.. I ran to Bo Peep and back. I think I'm getting into the swing of training. On Tuesday night, resolved not to let the commuting get in the way of training, I did my first interval run in the preparation for Beachy Head. Domestic need, that us to say the voice of the Burra Mem, made me curtail warm-up and cool-down to a half-mile. Hard work again, and the knee gave me trouble after the fifth mile, but that serves me right for not stretching. This is not the way to train for a marathon. I ran today for the first time since Sunday 6 July. It was hard on the legs, and on my breathing; my asthma seems to get worse. Down to the front, and along in a strong wind. About half way through I started to feel as if I was doing something familiar. 'Work No. 850 centres on a simple idea: that a person will run as fast as they can every thirty seconds through the gallery. Each run is followed by an equivalent pause, like a musical rest, during which the grand Neoclassical gallery is empty. For the last runs before training starts, I chose to go to Frog Firle on Friday, but missed High and Over out of the route to make a slightly shorter run. On Sunday I ran out to Bo Peep; at first it rained but stopped after the first mile. It was hard work and I felt tired. I hope that my new anti-hypertensive and asthma medication sorts me out soon. It dawned on me that, if I were to enter the Beachy Head Marathon, I needed to do so now, and start training next week, a sixteen-week programme of three runs a week, interspersed with other activity, such as swimming. So I have done so and my entry has been accepted. 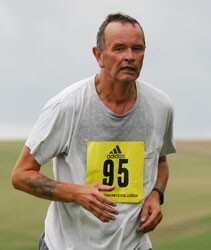 I shall not enter the Hastings Centenary Marathon.